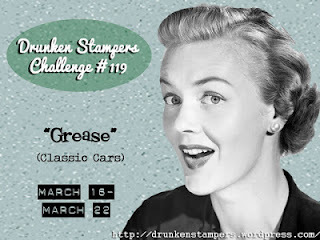 Visit the DRUNKEN STAMPERS BLOG for all the details on this challenge and to show some love to the Midnight Margaritas! Don't forget to link up your card for this challenge using the InLinkz tool. You have until March 22 to do that...you might be our next Life of the Party!! I found a super cute 50's drive in digi stamp set from DIGITAL DELIGHTS that I thought would be perfect for this challenge, so even thought it's the Midnight Margaritas' challenge week, I couldn't help playing along!! I wanted the car and drive in screen to look kind of old / vintage so after I coloured them I went over them both with an aqua painter to move the ink around a bit. Great card Donna, once again I'll be singing the bird song all day. I love your idea of the drive-in movie theme it's right on the mark. Umm, the word for today is a bad word! LOL! Donna, you totally rocked this challenge! Love the drive-in look to your card! A very cute card and loved the trip down memory lane where there were fun places and great music. love your card. great retro feel with coloring/painting and a fab layout. awesome design! OK, this is just far too cool, Donna! I love the way you created the drive-in! And the GREASE logo on the screen...and the bird has to be the word. I'm pretty sure Pee-Wee said so. Donna that card is just FUN with the drive in movie theme! Totally rocks girlie!